DC-3 N19454, owned by Southcentral Air but reportedly operating on a flight for Majestic Air Cargo, departed Unalaska Island for a cargo flight to Anchorage. The plane was carrying 2,350 pounds of fresh cod milt, or cod sperm, from Trident Seafoods. Somewhere between 8 pm and 11 pm a fisherman spotted the wreckage of the plane at the 1,500 foot level on Table Top Mountain near Eider Point, AK. Weather was poor in the area with heavy snowfall. The aircraft's construction number probably is 13863, although the FAA lists the plane as 25309. PROBABLE CAUSE: "The airplane flightcrew's failure to maintain adequate distance/altitude from mountainous terrain during a departure climb to cruise flight, and the captain's impairment from drugs. 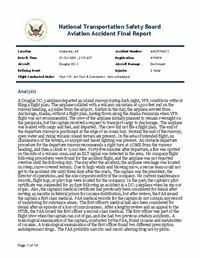 Factors in the accident were dark night conditions, and the first officer's impairment from drugs." Distance from Unalaska Airport, AK to Anchorage International Airport, AK as the crow flies is 1261 km (788 miles).